The Great Plains is a land of vast things. Vast grasslands. A vast horizon. A vast array of animal and plant life. But above all that (literally) is one of the Plains’ biggest features and resources: a vast sky. 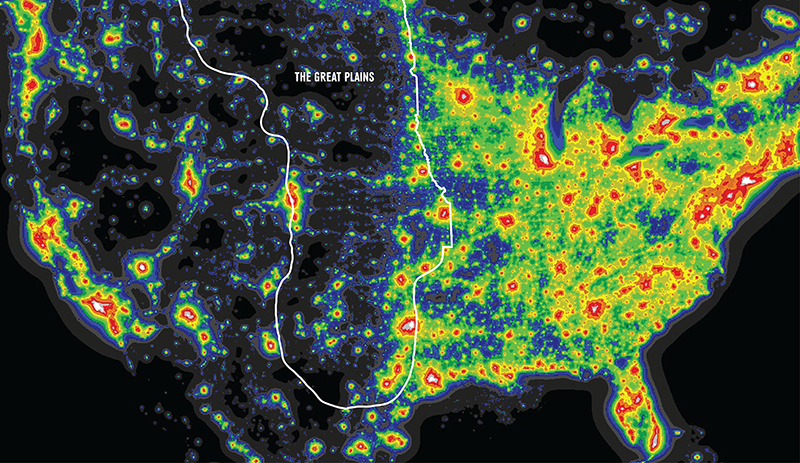 This classic night-time view of the U.S., adapted from the World Atlas of Artificial Night Sky Brightness, shows that we are a nation of light. We light our homes, our streets, our businesses. As a result, there aren’t too many places left to see the night sky in its full glory. Most nights in the city, you can see a couple of constellations and a few bright stars. It pales in comparison to what you can see without that light pollution. This photo was taken at the Nebraska Star Party at Merritt Reservoir near Valentine, Neb. 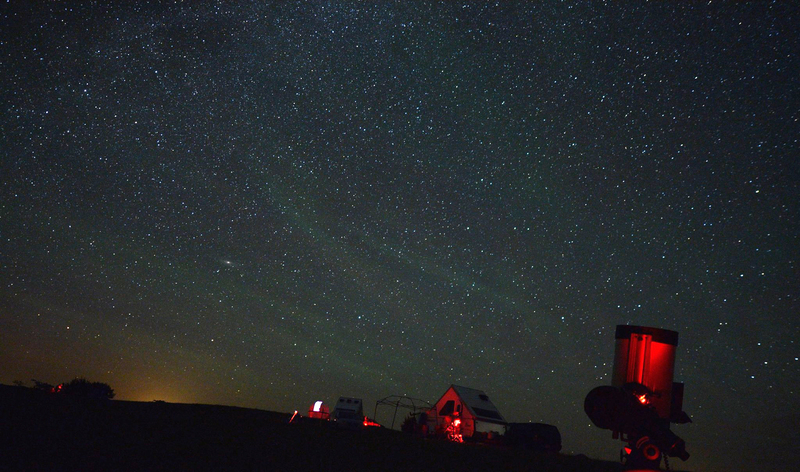 Nebraska Star Party’s John Johnson spoke at the Nebraska Agri/Ecotourism Workshop in Grand Island this year, where he explained that the night sky in the Great Plains is one of our greatest resources. 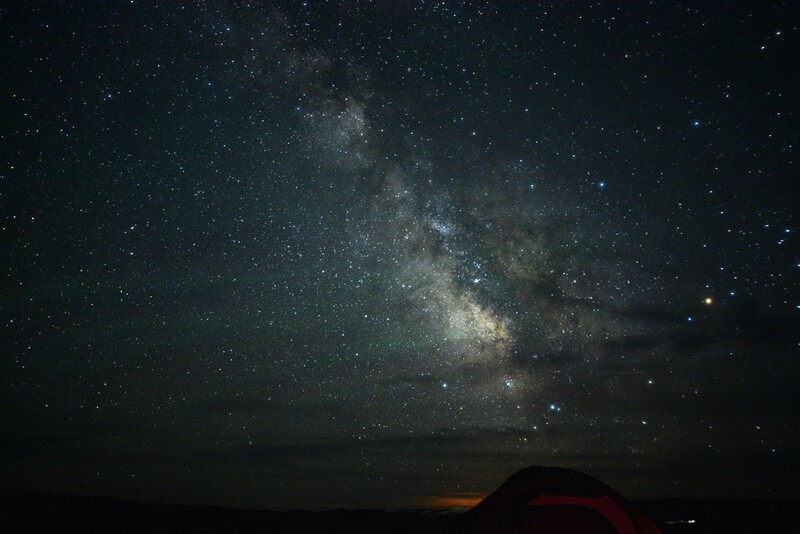 The Star Party (ranked as one of the top 10 best star parties in the country) brings in astronomers of all skill levels to the Sandhills to meet, view, and learn about the sky over North America. “People come from all over to see objects in the night sky they would normally never see,” he said. It’s all because of Nebraska’s dark skies. The darkest color in the shape above is an almost complete lack of light. Merritt Reservoir, home of the annual party, is at the crosshairs. Without much light pollution, it’s much easier to see stars, planets, even galaxies. Add that to the lack of buildings and clear air and the Great Plains has a recipe for a new breed of ecotourism — astrotourism. But the future of the night sky, like so many other natural sights in the Great Plains, isn’t secure. From 1947 to 2000, light emissions in North America rose 6 percent annually. It’s such a problem in some areas, lighting regulations have been developed in some areas including Tucson, Ariz., Flagstaff, Ariz., and portions of Northern Italy. Many of our nation’s national parks also have lighting restrictions and monitoring programs. And it’s not just the lack of beautiful sky that is impacted by light pollution. The circadian rhythms of the world’s nocturnal animals (and humans, too) are altered by the light. These animals’ normal life patterns are altered leading to stress and population loss in amphibians, turtles, and birds. We have a heritage of wide open expanses rimmed with black nights. 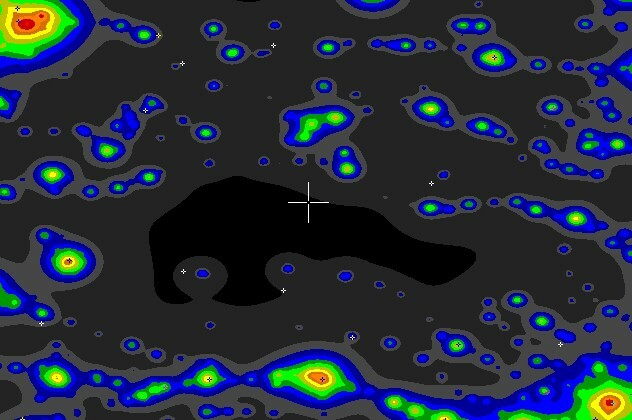 But unlike extinction, plowing a virgin prairie, or drilling into bedrock, the dark night sky is still there, behind that veil of light. It’s possible to recover. Measures like reducing upward-pointing lights, shielding, and lowering wattage can do a lot to cut light pollution and preserve the sky. Visit the Natural Resources Defense Council for more ideas. Just like stunning Great Plains scenery, mesmerizing wildlife, and interesting guiding experiences, stars can be another feature ecotourism operators can offer guests. People are seeking that return to nature and astrotourism is growing in popularity across the world. It’s such a popular movement that the International Dark Skies Association is awarding “Dark Sky Park” status for parks and natural areas across the world. Northumberland in Great Britain, for example, has attained Dark Sky Park status and now has visitors who come just for that brilliant night sky. Are you trying to attract serious amateur astronomers or just add a night of star gazing to your offerings? Serious amateurs probably won’t need a guide or equipment, but true beginners will need someone knowledgeable about the sky — and a telescope. For guides and training, contact the Nebraska Star Party (in Nebraska) or an area astronomy club (in the wider Great Plains). You’ll need a relatively flat area (in the Great Plains? Check!) with an unobstructed view of the horizon. Turn lights off (keep in mind your eyes will need about 30 minutes to adjust to the darkness and see the most stars). Or, if not possible, point lights down or add a shield or cap. Most astronomers are used to roughing it a bit, so if you lack cabins or bunks, a nice camping area works great. If someone is camping, make sure there’s reasonable protection against wandering livestock, as it can be hard to see much of anything on a moonless night. Weather in the Great Plains is often unpredictable. Make it known to your visitors that a summer storm or overcast night could possibly eliminate the chances of star viewing at any time. Astrotourism is certainly a smaller sect of ecotourism, but those who enjoy one will probably enjoy the other, Johnson said. And the night sky is certainly worth of our attention and protection. For more information on area Star Parties, visit http://earthsky.org/astronomy-essentials/astronomy-events-star-parties-festivals-workshops. All photos courtesy the Nebraska Star Party.